This month we’ve been sent two great images by our customers. The first is a beautiful photo, taken of a lovely new Margate range we’ve just printed for Mini Moderns, and is featured in Coast Magazine. created by UK design agency, Absolute Zero Degrees. 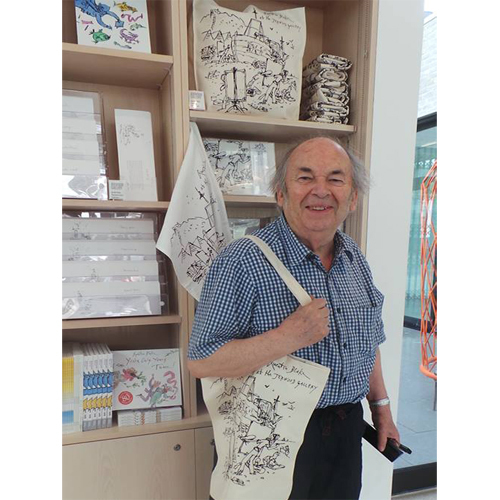 The second lovely photograph we’ve been sent was from the Jerwood Gallery in Hastings and shows Sir Quentin Blake, with a canvas gusseted bag we recently produced on their behalf, featuring one of his brilliant sketches. The Jerwood Gallery are currently having an exhibition, as part of the summer Jerwood Drawing Festival, called ‘Artists on the Beach’. This exhibition is featuring an exclusive display of Sir Quentin Blakes’ artistic responses to ten of his favourite artists from the Jerwood Collection. The exhibition of drawings playfully explores the stories of artists in the collection from Sickert to Wallis. 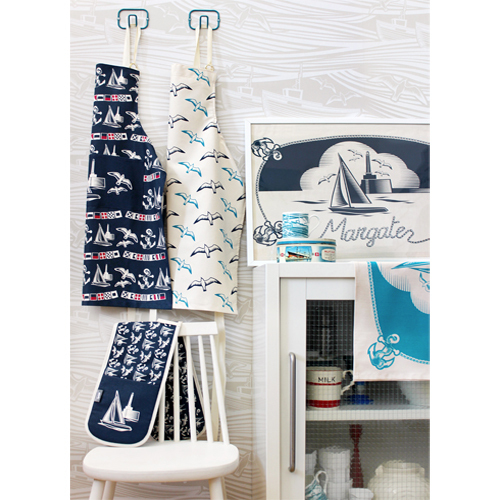 We were thrilled to be asked to produce tea towels and bags for the exhibition. Sir Quentin Blake actually commented in his speech at the private viewing that this was the first time his work had been put on a tea towel! We are honoured. Finally we are pleased to announce a new recruit to our Sales and Administration team. Claire Prendergast has recently joined us enabling our previous Sales Manager, Kim Evison, to start working alongside myself and our design team co-ordinating new artwork and orders. Dani Albright, previously working with Kim, has now taken over as Sales Manager. We have made this change as the amount of new designs we are currently receiving is growing enormously. By taking on an extra person we will be able to reduce our lead times at the artwork stages. The changes we made to our production processes over the eighteen months have improved our production lead times greatly. We are now hoping to make similar improvements at the visual and sampling stages too, thereby reducing overall lead times yet further.